Change in education is constant and this year the high school I work for, and the attached junior high, are going 1:1 with Chromebooks. Additionally, both are implementing a 25 minute “Focus Period” at the end of the day to address RtI needs and enrichment opportunities for all students. For me this was an opportunity too good to pass up. Teachers, just as students, come to our classrooms with varied experiences and bases of knowledge. Teachers need scaffolding and supports as much or more than students. Although the training could be arranged in a non-linear fashion, we chose to follow a board game style linear arrangement that was a natural progression of skills. Teachers can utilize the same training videos as the students, but the apple in the lower right corner is material just for teachers. This includes videos specifically for them about the training schedule, classroom expectations during the Focus Period, Arrowhead awarding guidelines, and suggested classroom methods. 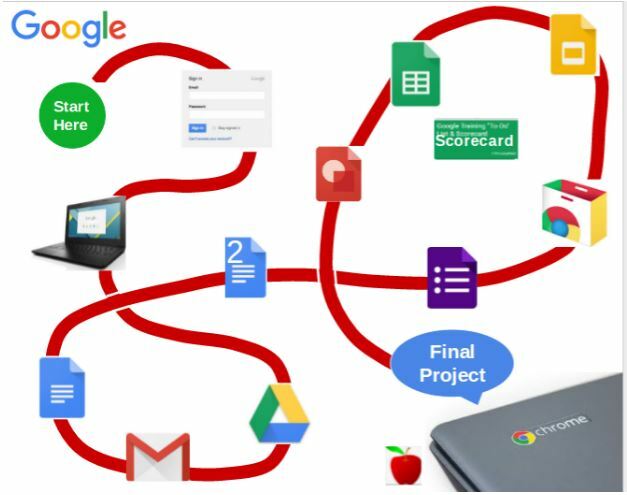 In the full document the “google” in the top left is a link to a single google doc that compiles all the information and links into one master doc for those teachers who do not wish to click each icon. Providing supports for both the content and professional expectations it is intended to help put the teacher’s mind at ease and help them know the whats and whys of the process. So every student and teacher is flipping, but it is only for one period for three weeks. This is the first entry in a series regarding this project, and I will be writing more about it as it unfolds. To a degree this is working without a net and we all know what they say about the best laid plans of mice and men. Check out the updates of the successes and failures of this massive flip at matthewtmoore.wordpress.com. I welcome discussion, comment, and dire warnings in the comments, or on twitter @matthew_t_moore. I love this too much. Bravo, Matthew — this looks like a ton of work. Please do keep the FLN posted on your school’s progress. I’m especially curious about the teacher buy-in.